What can I say? I am not a huge fan of summer. Sure I love baseball, Tales of the Cocktail, Gin Rickeys, Long Beach Island, seersucker, bikinis, and what not, but the heat, especially here on the East Coast makes it unbearable by the end of July. So I bid summer adieu! Arrivederci! Adios! And see ya next year! I'm ready for Autumn! Besides a relief from the humidity and heat, the end of summer lets me indulge in the Manhattan cocktail and her Brooklyn cousins. One of my favorite variations of the Manhattan is called The Greenpoint. This exquisite libation was developed by barkeep Michael McIlroy of Milk & Honey. It brings the herbal complexity of yellow Chartreuse into the Perfect Manhattan recipe by replacing the dry vermouth. Part perfect, part classic, The Greenpoint's taste is nothing but original. 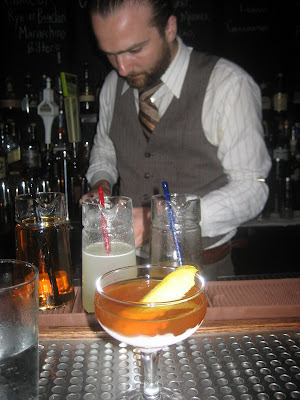 Last week, I was in Dutch Kills in Long Island City and broke my no Manhattans from Memorial Day to Labor Day rule! I had to with the man himself behind the bar. And it was so good, being so bad! Combine ingredients over ice and stir. Let sit for a minute or so and stir again. Strain into frosted coupe, serve up and garnish with a twist of lemon peel. Where to get it: Dutch Kills, White Star, and wherever Michael is behind the stick. Don Spiro and Diane Naegel keep the ball moving with their monthly Wit's End ode to the 1920s. 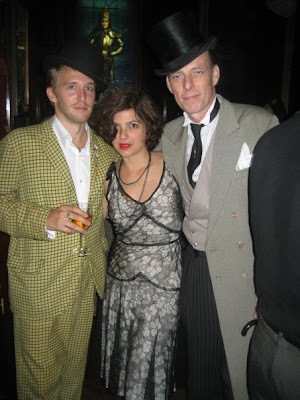 Fresh off their success at the Speakeasy at the Museum of New York which garnered a New York Times review and 700 retro clad attendees, the dazzling duo of vintage nightlife encourage you dress to impress - Gatsby style - this Saturday down on the Bowery in New York City. Oh by the way, it is also Diane's birthday - so now you have no excuses not to attend. Internationally acclaimed jazz banjoist and vocalist Cynthia Sayer and her ensemble perform sizzling vintage gems for your dancing pleasure at thei r Wit's End debut this August! 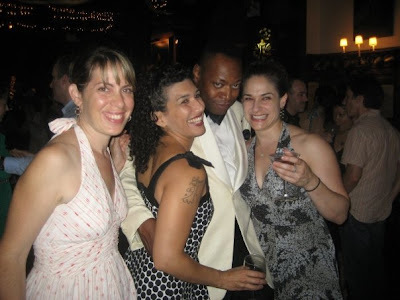 Cynthia has 10+ years under her belt with Woody Allen's Jazz Band (wow! ), and you can read more about her at http://www.cynthiasayer.com ! Neal Groothuis and Jeri Lynn Astra are BACK for a FREE beginner Balboa lesson at 8pm! We had such a great time with bal before that we're bringin' it back! Get a balboa refresher, or learn for the first time! BOOK GIVEAWAY! We are proud to offer yet another giveaway this month! 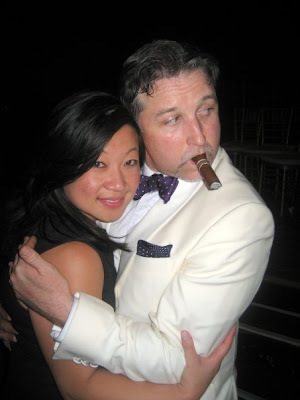 Kevin Fitzpatrick of the Dorothy Parker Society will be on hand to promote his new book, The Lost Algonquin Round Table ( http://www.donaldbooks.com ), and we'll be giving away TWO signed copies! Your admission gets your name in the drawing for these great prizes! Resident artiste Lawrence Gullo will be on hand offering portraits to our guests for a modest fee. (And by modest we mean an absolute steal!) You can view some of his work over at http://tzarohell.livejournal.com/ ! Last but certainly not least for our extras this August, it's our hostess Diane's birthday weekend! Who knows what surprises await! As always, we'll have a fabulous vintage cocktail menu and will be offering haute chocolates from our favorite chocolatier, Chocolats Meurens! Elettaria, Aktar Nawab's eclectic one and half year old restaurant and cocktail destination is closing tonight due to lease issues. The restaurant, whose cocktail menu was designed by mixologists Lynette Mararro, Brian Miller. and Joe Swifka, featured many rum and tiki drinks such as the Navy Grog which used the original 1941 recipe. The place was one of a kind, especially on Tiki Mondays. We are very sad to see the Elettaria go. Today is the last day of service at Elettaria restaurant in Greenwich Village. Chef/co-owner Akhtar Nawab, co-owner Noel Cruz and their partners have made the difficult decision to close the restaurant due to issues with lease negotiations. A personal project for everyone involved, the team did their best every day to establish and maintain the high standards for which the restaurant is known. Akhtar is proud of his work at Elettaria and looks forward to applying the experience he gained there to his future projects. "The Black Pearl like an old fashioned flying the jolly roger. dark and mysterious, old forester bourdon, cruzan black strap rum, demerara sugar, bitters." Swing Tuesdays. Bleecker and Broadway. Woodson & Ford, a speakeasy under the Corner Cafe. Down the steps, metal door. What's the password? When My Blue Moon Turns to Gold Again - but you didn't hear it from me. Hot outside but through the door a blast of cold air. Doorman checks guest list, I'm not on it. But I'm dressed impeccably. They say I'm good so I'm in. The oak bar takes up the length of the room which is reminiscent of low lit cave. The requisite taxidermy and leather club chairs were text book, but the libations were top shelf. 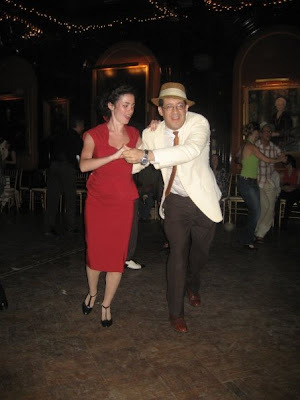 The scene on that Tuesday: Lindy hoppers. Some dressed in period, but most in civvies. They got there early. They marked territory. They were all business, meaning jitterbugging from the minute they put their dancing shoes on until the music stopped. They provided quite a show and thankfully there was air conditioning. They also have an excellent selection of "Wine, Ales, & Elixirs" which include wine by the glass or bottle(Brancott Pinot Grigio from New Zealand, Lacrima Di Morro D'Alba, Italy) and micro brews(Brooklyn Summer Ale, Magic hat No. 9, Blue Point Toasted Lager to name a few.) If you need to snack while imbibing, try their small plates menu that ranges from a $6 cheese selection to Wild Salmon Tartar, to Chorizo in Brandy & Red Wine. Check out W&F on Tuesdays for the Swing/Jazz night or any other day of the week for their world class cocktails and cool vibe. Come, celebrate with us another year of jubilance, decadence and depravity amongst the finest of femmes and fellows at Dances of Vice. Entering our third year, a new saga of forgotten eras unfolds, as Dances of Vice joins forces with the sensual sophisticates of COMPANY XIV to continue our nocturnal phenomena at the "Dance Eden" that is their theater in Carroll Gardens. 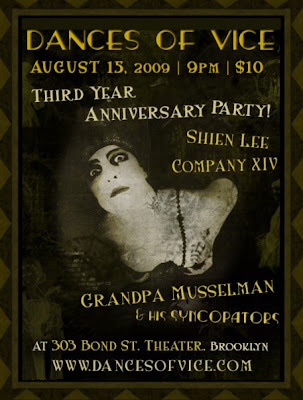 Our Third Year Anniversary Party will feature a musical performance by Miss SHIEN LEE with the scintillating syncopations of GRANDPA MUSSELMAN and His Syncopators, and the exhilarating dramatics of Company XIV. In honor of this special occasion, PUREVILE! will be offering an exclusive discount of 20% off items over $50. Also, have your portrait hand-painted by roving artist LAWRENCE GULLO, who will be seeking out inspiring and well dressed subjects. Complimentary lashings of specialty HENDRICK'S GIN punch for the first 100 guests! Hendrick's cocktails offered throughout the evening at most unusually discounted prices. NOTE: NHK, Japan's national broadcasting organization, will be filming at this event for their upcoming documentary on Neo-Victorian style and subculture. In attending the event, guests grant permission to DOV and NHK to use photos and video taken of them to be used for the documentary and related promotion. I have to confess. I was not the first on line to get into Mayahuel when it opened. I heard "tequila" bar and arched my eyebrow. I'm more a gin and rye guy. Plus, I have a two month rule: I do not go to a new bar/lounge until they have been open for at least two months. This helps them get the opening kinks out of the way. I succumb to the best inducement of all - free drinks! The decor didn't grab me at first the way it does when you walk into a PDT or Death & Co. The space seems disjointed, as if the bar was built around a multi-floored storefront with irregular rooms. It didn't seem like a cocktail lounge. But Mayahuel isn't trying to be a cocktail bar that specializes in tequila, it is a tequila bar that specializes in tequila cocktails. And by tequila I mean the real deal from Jalisco province in Mexico, blue agave, or mezcal, and all quality. You can enjoy a hand crafted cocktail from co-owner and Death & Company veteran Phil Ward and his crew behind the stick. Or you can sip one of their stellar selection neat. Really anything goes. There are no behavior rules a la the speakeasy posted in the bathroom. You can be loud here, but it ain't Margeritaville, the tequila is the center of your attention not a sun burnt shot off a body part. Mr. Ward employs the cocktail trifecta that makes Mayahuel a must visit for any bon vivant. First, the ingredients: mole bitters, agave nectar, freshly squeezed citrus juice, fresh fruit such as watermelon, and pomegranate molasses are just the beginning. There is jalapeno infused tequila, cocktails with tea infusions, and a spicy sangria that push the bar (no pun intended) higher for the cocktail aficionado. Second item is the innovation. Tequila cocktails? Are you serious? Mr. Ward is deadly serious and needs no words of persuasion. His actions - crafting exquisite libations using this overlooked spirit - will broaden your horizons and help you see beyond whiskey, gin, and scotch as base spirits for your cocktail. Soon you'll be ordering them without being in Mayahuel. Head over to Allen & Delancy if you don't believe me, their latest menu is all tequila. Finally, a convivial environment where one can have decent conversation and a staff that is very attentive and friendly. Sit in one of the intimate nooks, at the bar, or upstairs in the dining room. Order some Mexican specialities from their menu. The food ranges from small shareable plates like tacos to entrees such as the sublime cochinita (pork belly) and tamales. There is dessert too! The place is homey and laid back, loosen your tie, you'll be there for a while. The Mexicano (Reposado Tequila, Carpano Antica, and Mayur's Picon) is served with a sizable hunk of hand chipped ice. The drink is touted as their version of the classic Italian aperitif, "The Americano." Clearly, I was skeptical but that weariness was erased with one sip. The Mexicano tasted like dark savory chocolate and went down too smooth. Phil Ward agreed and pointed to the Carpano Antica Formula vermouth. The Carpano and the tequila really blend together in a unique way that I have never experienced. As a Manhattan and Brooklyn aficionado, I was very eager to taste the Italian Inquisition with reposado tequila, Punt e Mes, Averna and Solerno, Xocolati mole bitters. Served in a vintage square cocktail glass, the Inquisition was a party on my palate. 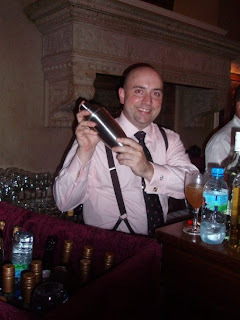 The Averna was enhanced by the bitters, and the tequila, punt e mes blended well creating a smokey tasting drink. 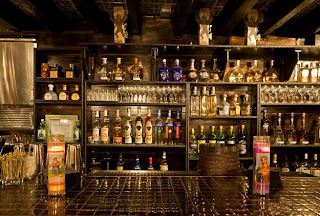 Reposado: is tequila aged for two months up to eleven months in oak barrels. Blanco: is bottled within two months of distillation and is the purest version of agave. Anejo: is aged or vintage Tequila that has been rested in small oak barrels for more than one year. Mezcal: Agaves that make up Mezcal which are blends are usually roasted and cooked in the earth and stone pit resulting in a rich smokey flavor. Mayahuel is changing the cocktail landscape and is a place to break the rules! Read the NY Times review of Mayahuel. The Salon at Players Club was a smashing success. The rain let up, the heat subsided, and the crowd showed up dressed to the nines. The Players Club is a private club opened by actor Edwin Booth in the late nineteenth century. They were kind enough to open it up to the general public for The Salon so we could we have a unique event in a magical space. I was amazed to see how they fit the entire 18 piece Harlem Renaissance Orchestra on that stage. The band didn't miss a beat and kept lindy hoppers dancing all night. During intermissions, Melody Sweets who performs at the Box, "This is Burlesque" at Corio, and Sugar Shack Burlesque, sang and showed lots of skin. 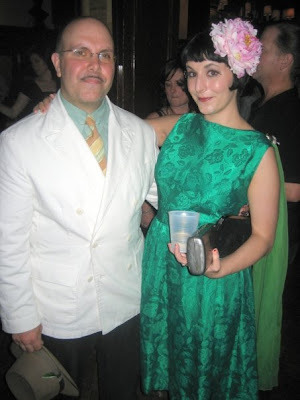 Meanwhile, DJ Swank clad in Tuxedo #9 spun lounge, exotica, tiki, big band, jump blues, and hot jazz. The crowd showed up in their best summer attire despite the relaxed dress code policy. 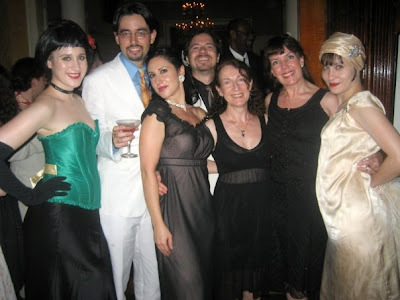 Seersucker, cream colored dinner jackets, cocktail dresses, feathered hats, straw fedoras, and elegance ruled the night. I was behind the stick with the bartenders of Elegant Affairs Caters making signature cocktails. I actually pre-made several classic summer favorites and trained the staff in the execution of the drinks prior to doors opening. Below are some images from the night courtesy of our friend Lynn Redmile. For the complete set visit Lynn's page. Thank you to all that came out to support us! 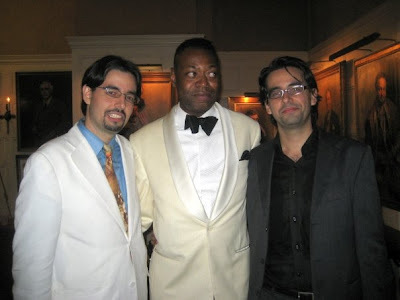 Next Salon/Loungerati collaboration will be October 9th at the Players Club with the Ron Sunshine Orchestra!